Town Crier declares the opening of the Barrie Historical Archive with former Mayors cutting the red ribbon behind (1). 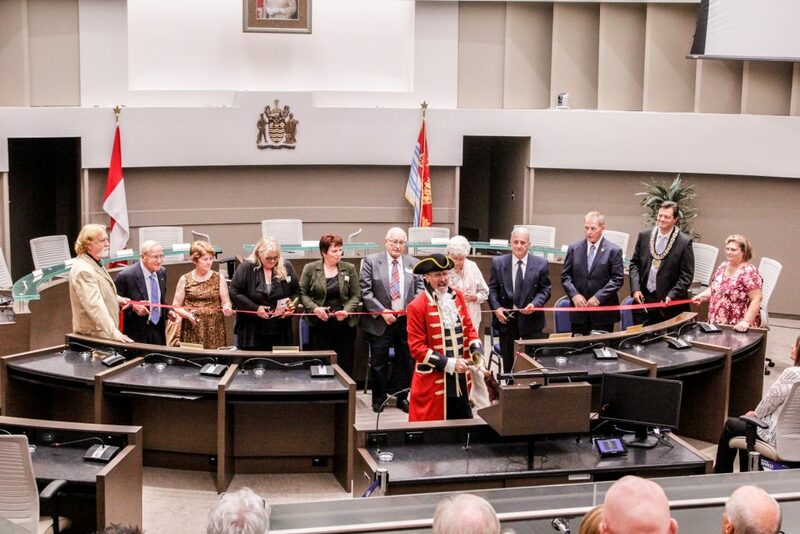 Home/Town Crier declares the opening of the Barrie Historical Archive with former Mayors cutting the red ribbon behind (1). Tags: Barrie Historical Archive, Barrie Town Crier, Carol McLuhan, City Hall, Council Chamber, Dave Aspden, Janice Laking, Jeff Lehman, Jim Perri, Lorraine Morgan, Marla Bentley, Mayor Dave Aspden, Mayor Janice Laking, Mayor Jeff Lehman, Mayor Jim Perri, Mayor Ross Archer, Mayor Willard Kinzie, Nancy Dickey, Ribbon Cutting, Ross Archer, Steve Travers, Willard Kinzie.